Born in Florence, Massimo studied architecture with Giancarlo De Carlo at the University of Genoa. In 1991 he collaborated with the Renzo Piano Building Workshop on the redevelopment of the Lingotto factory in... Read more Turin. After joining Herman Hertzberger Architectuurstudio in Amsterdam and working on a number of projects in Italy, Germany and Japan, he moved to London in 1998 to work freelance on architectural and urban renewal schemes throughout the UK. Since 2001 he has run his own private practice in London, concentrating on architecture projects, competitions, and product and furniture design; his works have been presented at shows and exhibitions in Milan, Rome, New York, Shanghai, Berlin, Paris and London. In 2011 he was awarded an Honorable Mention at the XXII ADI Compasso d’Oro. His first product for Hitch Mylius, hm101 was launched at Clerkenwell Design Week in 2012, with further products in development. 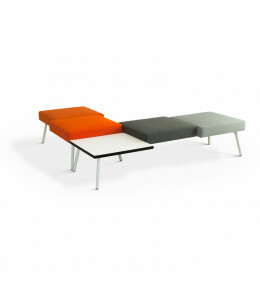 HM101 Upholstered bench seating provides practical soft seating for waiting areas.